René Derouin’s recent works continue his observation of nature and today’s society. His many migrations have made him aware of the rapacity of our age. 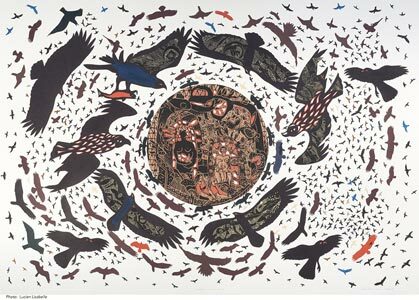 Drawing his inspiration from birds of prey, he has created works of great density in a poetic metaphor on the turbulence and voracity of our society. These keen-sighted birds have prompted a series of new works that capture the imagination. Derouin offers some disquieting thoughts on current society: fragmentations and rapacity in an agitated world.